June marks the beginning of the raining season. 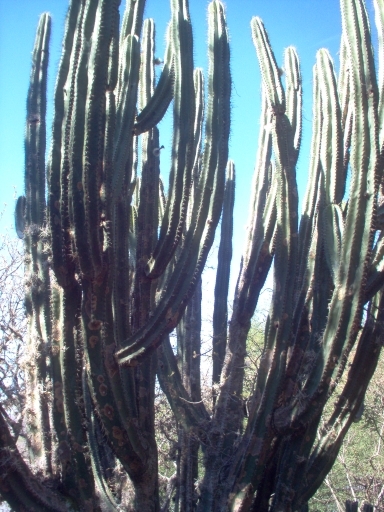 Most fruits and vegetables are not reading for picking yet, however, the flower of one type of cactus converts to fruit and is ready for harvest at the very beginning of the rainy season. On Sunday, we started off early to minimize heat exhaustion and went in search of pitayas. We went to the presa (lake) near Quiahuyo where we fetch our drinking water. (See Water Woes) It was especially low because last year’s rains were less than normal. During the rainy season, this lake is almost 3 times as wide and has hidden deep areas that often become muddy traps for cattle and swimmers. Even this shallow, the presa (lake) teems with fish. Fishing with nets is prohibited so that the fish population isn’t eradicated, however, that doesn’t stop local fishermen. 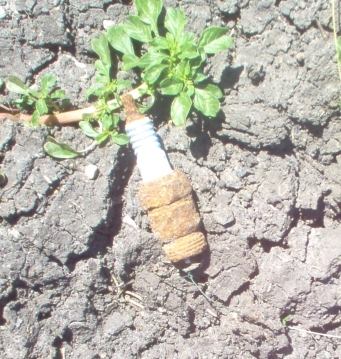 Old spark plugs are used in fishing. All along the edges of the lake, we found rusty spark plugs. Since there was no way for a vehicle to get through the mud and rocks, this seemed odd to me until my husband explained that the spark plugs weigh down the plastic soda bottles that are tied to the fish traps. When the bottle bobs, fish have been caught. In order to get to the pitayas, we had to cross an area where cows came down from above to drink. As the cattle didn’t seem too pleased to be disturbed, we moved quickly. My son even took off his red t-shirt so as not to attract the attention of the toros (bulls) guarding their herds. 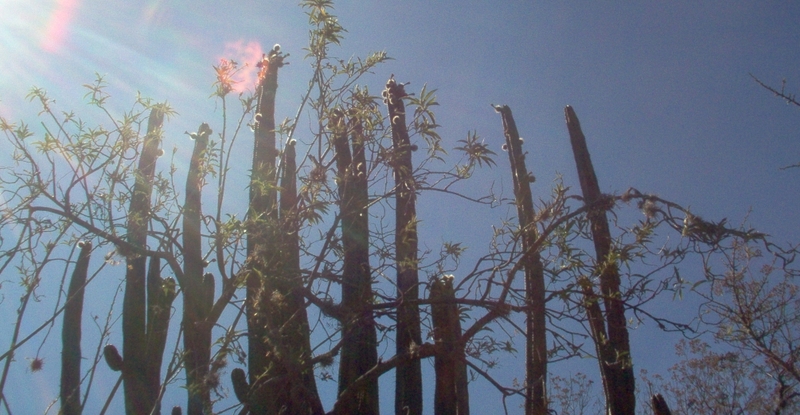 Just a bit further on, we found a good number of cactus. Pitayas are the spiny balls found at the top. Unless you are a chuparosas (hummingbird) harvesting them requires a very long forked stick. Fortunately, my husband is an old pro and we had a bucketful in no time. To eat pitayas, you must slice them open, being careful not to get espinas (thorns) in your hands as you hold them still. Then, once the fruit is exposed, use your thumb to pop half out and pop it in your mouth, again, checking for stray espinas (thorns). The fruit has the consistency of seedy brains and tastes a lot like strawberries. Pitayas come in red and yellow, depending on the color of the flower on the cactus. We were in luck and found both and thoroughly enjoyed a sweet treat. We are so fortunate to live in an area where the earth provides an abundance for her people. It does take more effort than going to the corner store for chatarra (junk food) but what is life without a little effort?